Throughout our lives, the way we learn to interact with others and build relationships has a major impact on not only our social lives, but our physical, mental and emotional health as well. For seniors, some of the main benefits of social interactions are similar to those of physical exercise: a boosted mood and less risk for depression, a sharper mind and reduced risk for chronic conditions like osteoporosis, cardiovascular problems and even some cancers. 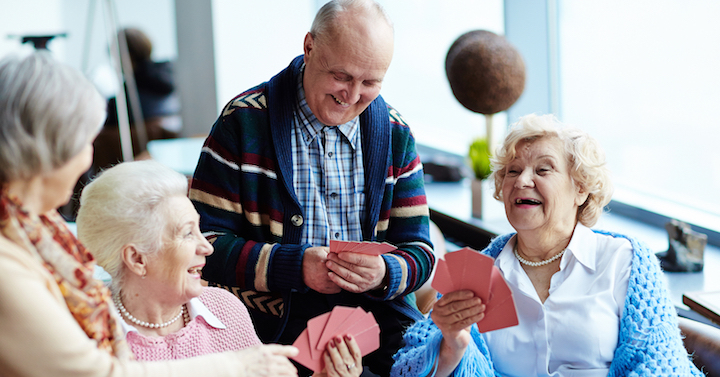 Several recent studies reveal that seniors who engage in regular social activities are less likely to experience cognitive decline that sometimes leads to Alzheimer’s disease. Avoiding social isolation can even help you live longer, with a higher overall quality of life. For instance, seniors tend to make better food choices and eat more when dining together, leading to improved nutrition habits. You’ll sleep more soundly, as loneliness can make it difficult to get a restful night’s sleep. Plus, you’ll enjoy a boosted immune system, which helps ward off illnesses like the flu or common cold. Plus, aside from the health benefits, staying socially engaged with others as you age gives you a sense of belonging and keeps you connected to the world. Do some volunteer work. Volunteering at a local hospital, animal shelter or offering consulting services not only allows for meaningful social interactions, but also provides a feeling of self-worth and accomplishment. Try out a gym. Since staying physically active is also vital to healthy aging, find a local gym or fitness center that offers equipment or classes designed for seniors. Find a club that matches your interests. Enjoy reading? Golfing? Going for long walks in the park? Joining a club or group is a great way to meet others and share experiences with those who have similar interests. Explore lifelong learning opportunities. Local colleges or community centers often offer classes for seniors, and these are a great way to expand your mind and creativity. Take a writing class, art class, history class – anything to keep that brain engaged while spending time with your peers. Head back to work. If you’re able, find a part-time job at a place you’d enjoy working. This will not only keep your mind stimulated and provide the chance to talk with others on a regular basis, but it will also put a little extra money in your pocket every month! Spend time with family. Adult children often lead busy, hectic lives, so reach out and offer to watch the grandkids for a weekend. Or, invite them all over for lunch on a weekly basis. Connect with others through technology. The internet has been an important tool in keeping people connected. And, more seniors are using technology than ever before! When friends and family don’t live nearby, you can stay in touch through email, social media or even Skype. The benefits of social interactions will last well into your later years, enhancing your daily life and giving meaning to your days. Find whole-person wellness at Immanuel Lutheran Communities! We understand how important it is for our residents to stay socially active and engaged, and you’ll find a wide variety of regularly scheduled on-site and off-site events to allow you to continue to build relationships in your retirement years. Contact us today to schedule a personal tour.